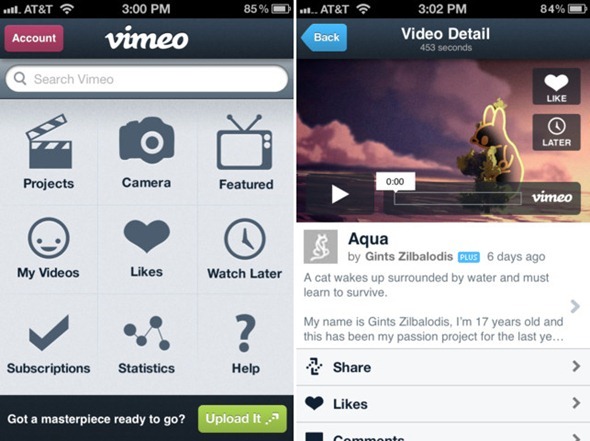 Today, during the Mobile World Congress in Barcelona, Vimeo have pushed out the major update to their iPhone app that they said was coming earlier this year. Finally introducing a proper, native iPad UI, the update also packs improvements to the iPhone UI, on top of an array of other enhancements. 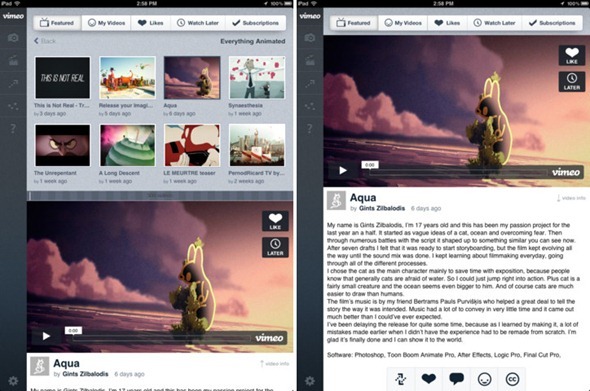 At CES 2012, when Vimeo released their Android and Windows Phone 7 apps, they teased that a major update to the iPhone app was in the works that would also introduce a proper iPad UI. Their decision to go gung-ho in mobile was fueled by the rise of mobile traffic to 15% – where it sat last month – compared to 7% in January 2010. Many App Store reviewers have been longing for an update to the Vimeo app for quite some time now – not necessarily for UI improvements, or even for proper iPad support – but primarily for stability improvements. A number of users have been reporting various bugs, such as frequent crashing on the iPhone 4S, inaccurate statistics reporting, broken social network sharing, and no audio playing. While bug fixes were not noted in the changelog, we can hope that this major update does address these issues. Surely, users will forget about the UI improvements and additional features if the app is always crashing. Vimeo Music Store integration in the video editor. Shoot video, create projects, and browse our featured channels without logging in or signing up. View your Subscriptions, Likes, and Watch Later album. Share, add comments, and view licenses, credits, and likes on other peoples’ videos. Excited about these features and eager to snag the app ASAP? Don’t panic if you search for it on your iPad and you don’t see anything listed under ‘iPad apps’ for Vimeo; it’s essentially a universal app where the iPad UI was added to the iPhone app. So, just download that and you will be good to go. Let’s also hope that the various stability issues were fixed in this update.